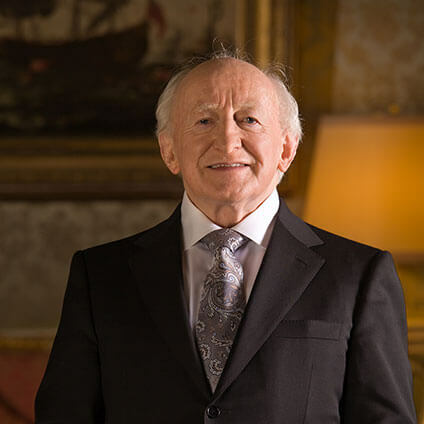 President Michael D. Higgins is the ninth President of Ireland and took office on 11th November 2011 for a seven year term. The President is a political scientist and sociologist by profession and spent many years as a lecturer in political science and sociology at the National University of Ireland, Galway and in the United States. He has previously served at every elected level of public life in Ireland, including as Ireland’s first Minister for Arts, Culture and the Gaeltacht. President Higgins is a fluent Irish speaker. President Higgins has campaigned for human rights worldwide and in 1992 was the first recipient of the Seán MacBride Peace Prize from the International Peace Bureau in Helsinki. He is a writer and poet and has published two collections of essays and four collections of poetry. He is a member of the Royal Irish Academy. In his first year as President, with his initiative, Being Young and Irish, he engaged directly with Ireland’s young people asking them for their ideas on how to resolve Ireland’s social, political, economic and cultural issues. In 2014 and 2015, in collaboration with Ireland’s third level institutes, The President of Ireland’s Ethics Initiative, througha series of over 50 nationwide events, explored the ethical questions and challenges facing Irish and international society.